Multiple layers of transparent polycarbonate and thermoplastic armor, coated with a spall shield and backed with ultra-light weight laminated glass. Protects the user against blunt impact and artillery fire. Born and raised in the Pacific Northwest, Craig "Blackbeard" Jenson decided that he wanted to be a Navy SEAL at a young age and devoted his life to achieving this goal. He sees SEALs as an ideal blend of mental and physical abilities and strives to optimise both of these traits in himself. 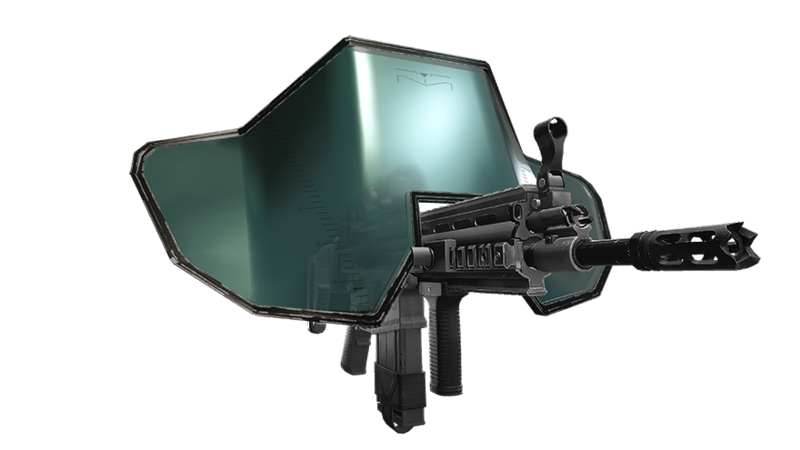 He is equipped with the Transparent Armoured Rifle Shield, a prototype based on existing armor shield technology for tank gunners. This Rifle Shield allows for increased protection, absorbing the impact of high velocity rounds and blunt objects, without diminishing the field of vision.